When Helen is summoned by a former student to view a cache of newly discovered seventeenth-century Jewish documents, she enlists the help of Aaron Levy, an American graduate student as impatient as he is charming, and embarks on one last project: to determine the identity of the documents' scribe, the elusive "Aleph." 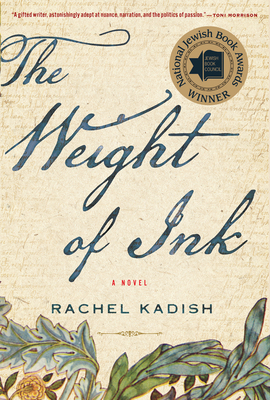 One of The Jewish Exponent's "2017's Top Reads"
"Rachel Kadish’s The Weight of Ink is like A.S. Byatt's Possession, but with more seventeenth-century Judaism...A deeply moving novel." "Rachel Kadish’s novel The Weight of Ink is my top Jewish feminist literary pick. Kadish’s novel weaves a web of connections between Ester Velasquez, a Portuguese Jewish female scribe and philosopher living in London in the 1660s, and Helen Watt, a present-day aging historian who’s trying to preserve Ester’s voice even as she revisits her own repressed romantic plot. Both Ester and Helen are part of a long literary line of what writer Rebecca Goldstein has termed 'mind-proud women.'" "So many historical novels play with the 'across worlds and centuries trope,' but this one really delivers, tying characters and manuscripts together with deep assurance. A book to get lost in this summer." "An amazing feat...A great literary and intellectual mystery...you feel as if you're sifting through these letters yourself...a very immersive summer read." "This astonishing third novel from Kadish introduces readers to the 17th-century Anglo-Jewish world with not only excellent scholarship but also fine storytelling. The riveting narrative and well-honed characters will earn a place in readers' hearts." "A mysterious collection of papers hidden in a historic London home sends two scholars of Jewish history on an unforgettable quest....Kadish's characters are memorable, and we're treated to a host of them: pious rabbis and ribald actors, socialites and troubled young men, Mossad agents and rule-worshipping archivists. From Shakespeare's Dark Lady to Spinoza's philosophical heresies, Kadish leaves no stone unturned in this moving historical epic. Chock-full of rich detail and literary intrigue." "The Weight of Ink tells of the struggle and the triumph of a woman trying to do justice to the largeness of her intellect and ambition. As audacious in its conception as it is brilliant in its execution."